The Devil Inside–a Tapestry Opera , Scottish Opera, and Music Theatre Wales co-production–is a new opera that explores weighty themes. James and Richard seek shelter in a mansion while lost in the mountains. The mysterious old man who lives there persuades them to buy a bottle containing a magical imp that can grant any wish. There’s only one catch: the bottle was forged in hell, and it is cursed. Anyone who dies while still the owner of the bottle is damned to eternal hell. The music was in a modern vein that relied heavily on dissonance and chromaticims. I must confess, I have never developed an appreciation for atonal music, so this had a significant impact on my enjoyment of the show. With that caveat, the production was excellent. I still appreciated the thoughtfulness of the music, which clearly communicated the malevolent chaos of the imp with sweeping, yet jagged lines and richly textured, creative instrumentation. The cast of four singers all had excellent voices. I was especially enamored with the voice of Nicholas Sharratt in the role of Richard, who is kind of like this story’s Sméagol. His voice is sweet, clear, and very affecting. His struggle between doing what is right and what is easy was very believable and relatable. 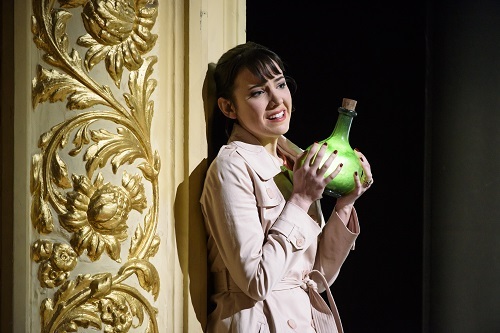 Rachel Kelly has a textured and robust mezzo-soprano voice, and gave a strong performance as Catherine, James’ client and eventual wife, who wrestles with the question of whether good can be born from evil. James, played by baritone Ben McAteer, was persuasive as the show’s moral centre. James is continuously trying to break free from the bottle’s chains because he is keenly aware of what the others have missed: earthly riches are not worth poisoning the soul. Baritone Steven Page was appropriately foreboding in the role of the old man who strikes the fool’s bargain with the two hapless young men at the beginning. His ominous body language and vocal tone skillfully foreshadowed the misfortune awaiting anyone attempting to control the bottle. The highly symbolic nature of the story was well captured by the use of symbolism in the set and prop design, most notably Catherine and James’ large white marriage bed emblazoned with a disturbing Rorschach inkblot. The bottle was of course the most relevant prop in this work, and was intentionally unassuming; a fitting mask for the horror within. The story was set in the present day, so costumes consisted of regular street clothes. The level of musicianship in this production was impressive, from singers and orchestra alike. The opera was accompanied by 14 soloists of the Orchestra of Scottish Opera. The performers clearly immersed themselves in the atonal complexity of the work, and every note resonated with confidence and clear understanding of the dark, ominous mood of the piece. This production is the North American premiere of The Devil Inside and provides a great opportunity to gain exposure to new opera from across the pond. This work is a great option for fans of modernists such as Stravinsky, Schoenberg and Bartok. Ticket prices range from $29-105. Groups of 10+ can purchase tickets for $24-84.